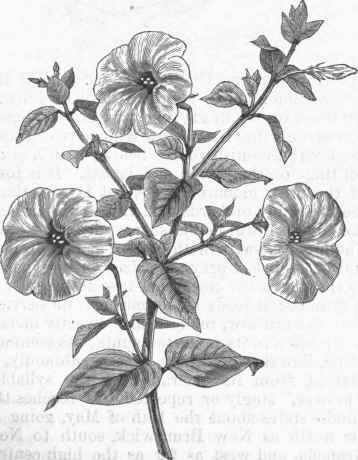 Petunia, the botanical as well as the garden name for an ornamental plant, from petun, a name used by South American Indians for tobacco, and applied to this related genus of so-lanacece. The plants are perennial herbs, becoming woody at the base; the leaves alternate, simple, and as well as the young stems sticky with a viscid pubesence; the flowers are axillary and solitary; the lobes of the calyx spoon-shaped; the corolla funnel-formed or salver-shaped; the spreading limb slightly five-lobed and somewhat unequal; the five unequal stamens included within the tube; the ovary ripening into a two-celled, two-valved pod, with numerous minute seeds. The species first introduced was P. nyctaginiflora, brought from Brazil in 1823; it originally had a white flower with a very long tube, and was for a long time a popular plant; in 1831 it was followed by P. violacea, a much more slender and weaker plant, with rose-colored or violet purple flowers, having a shorter and broader tube than the. other; this also became a favorite garden plant. 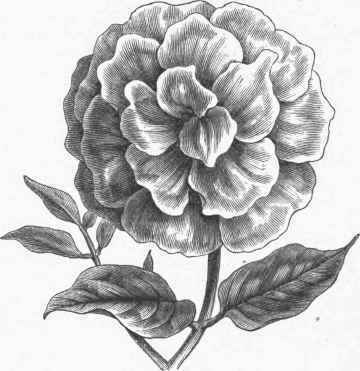 From these species there have been obtained, by hybridizing, crossing, and selecting, a large number of varieties, so much superior to the originals that these are rarely seen in cultivation; some of these varieties are so well fixed that they come true from seed, like the " Countess of Ellesmere," which has a deep rose-colored border and a white throat; the various blotched and striped varieties do not reproduce themselves so constantly, but give flowers with a great variety of markings, some of them of much beauty. Another set has the border of the flower fringed; others have the flowers margined with a distinct color, in one case with a band of deep green. Besides the numerous single varieties, there are many double ones, some of which are sufficiently distinct to have received florists' names; they are often so very double that the original form of the flower is lost in a confused mass of petals. Although the petunias are perennials, they flower so soon from the seed that they are treated as annuals. They are much used for planting in masses; the stems spread for several feet, and the plants should not be crowded; as single specimens, they are best trained to a stake. The double kinds are unsuited for outdoor culture, their flowers being so heavy that they are broken by winds, and they decay when wet. Choice kinds, and especially the double ones, are propagated by cuttings. Petunia - Garden hybrid, single.